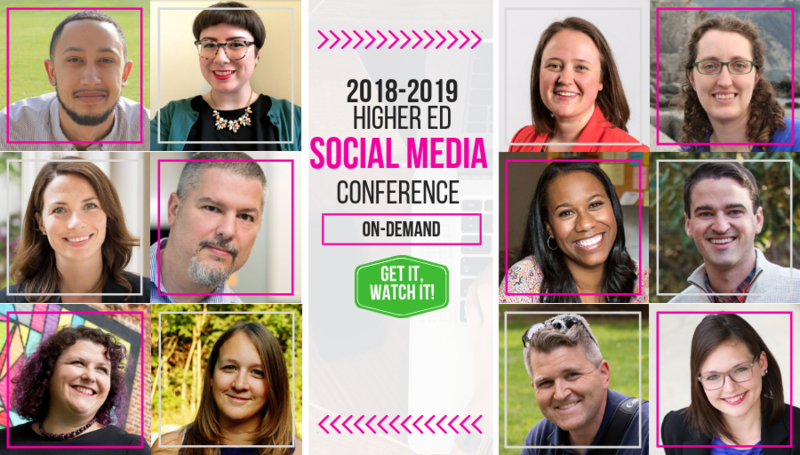 The 6th Annual Higher Ed Social Media Conference (Nov 28, 2018): the only online conference that makes attendees smile! The Higher Ed Social Media Conference has been a big hit with the community since its launch in 2013. Every year, several hundred participants working for colleges and universities in the US, Canada and the UK gather around big and small screens to attend this must-attend conference for higher ed social media teams looking for inspiration, advice and best practices to borrow. Are you noticing the “smiling pattern” on these photos? Year over year, it’s consistent: the audience is happy and engaged. No small feat for an online conference! That’s why the conference is back for its 6th edition on November 28, 2018.
it doesn’t require a budget to present AND will even help you save some professional development money, because there is no need to travel AND presenters receive a free pass ($500 value) to attend the whole event WITH their team! You’ve got less than 1 week left to submit your proposal! Oh, and Sep 29, 2018 is a hard deadline – it won’t be postponed, because the conference program will be announced on Sep 26, 2018. Whether or not your proposal is accepted, you will get notified super fast. Not ready to present, but want to attend the conference? We will have a limited number of seats as the online room is capped. You can register now and secure your seat via credit card.